A blizzard dumped a large amount of snow on the city of DeKalb. A major fire took place and the DeKalb Fire Department was hampered by the fire hydrant being buried in snow and difficult to locate. Troop 33 volunteered to dig out fire hydrants on December 23, 2000 in that section of the city. The fire department provided street maps with hydrant locations. Scouts took to the streets finding and digging out fire hydrants to improve the safety of city residents. We spent a week working to help transform the abandoned Hughes-Kirk High School high school in Beechmont, Kentucky into a disaster resource center. When completed it will provide classrooms for disaster relief training, emergency housing, control and logistic support, and a distribution center to support critical needs of upcoming disasters. 1. Contributed money to "His House" project. 2. Removed debris from various parts of building. 5. Worked to improve outdoor grounds. 6. Contributed money to "His House" project. 7. Unloaded trucks and organized storage. 8. Cleaned various parts of building. 9. Worked to clean up grounds area. Major flooding caused roads and bridges to close, with flooding damage to area homes. Troop 33 volunteered to fill sand bags for flooding areas in the Sny Island Levee System. Troop 33 volunteered to move sand bags and place them in flooding areas near Dawn Court in DeKalb. Flooding caused roads and bridges to close, 600 area residents were displaced from their homes. 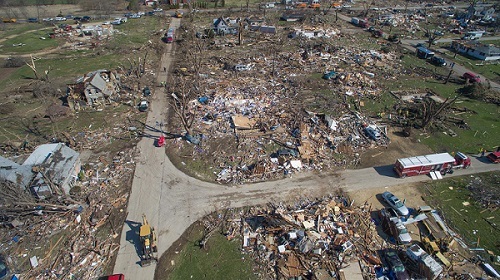 Illinois Governor Blagojavich declared DeKalb County a disaster area. Troop 33 volunteered to provide food in the initial days and provided some food service equipment on loan for local Red Cross Chapter to use. We reconditioned donated bicycles and provided clean-up efforts removing sand bags in DeKalb. In August 2016, prolonged rainfall in southern parts of the state of Louisiana resulted in catastrophic flooding that submerged thousands of houses and businesses in several communities. Troop 33 conducted a collection effort for donations for infant items, personal hygiene and general clean-up supplies. A fully loaded 1-ton van transported donated items to Louisiana. The van also served tp transport emergency supplies for two days while in Louisiana. Hurricane Andrew made landfall on August 24, 1992. With wind speeds up to 165�mph, it was a powerful Category 5 hurricane. Ground zero was the town of Homestead, Florida, south of Miami. Over 25,000�houses were destroyed in Miami-Dade County alone, with 100,000 more severely damaged. 65 people were killed and the damage total across the affected regions exceeded $26�billion. DeKalb County residents responded by donating food, clothing and other items. It became a local project known as "Operation Florida Storm", which was a spin off from the name of the Middle East military effort, Operation Desert Storm. A distribution center was set up at the former Brown's Supermarket building on State Street in Sycamore. All types of local clubs, sports teams, civic groups, churches, etc., worked sorting and organizing donations. Troop 33 Scouts worked at the distribution center in Sycamore on September 13, 1992. It was our first service project to benefit a national disaster. Read about this project at the BSA's Good Turn for America website. We spent Easter week 2006 in Mississippi where we prepared 2,000 meals for volunteer workers at Pass Christian, MS., worked at God's Katrina Distribution Center, and helped at the ARNO animal rescue center in New Orleans, where, among other projects, rescued 13 puppies from beneath abandoned buildings. To read about our trip in the Jan/Feb issue of Scouting Magazine, click here. A team of Troop 33 Scouts biked nearly 500-miles for Katrina, from Memphis to New Orleans in June 2006. We raised money per mile biked from sponsorship. Ending the ride in New Orleans at the national convention for the American Library Association, we presented a check for $3,000 at the opening ceremony to benefit libraries in the Gulf region damaged by hurricanes Katrina and Rita. To read about our effort in American Libraries Magazine click here. to the American Library Association. 1. Conducted fundraisers to raise money for hurricane relief. 2. Collected and transported 3 tons of critically needed supplies. 3. Prepared banquet at Keesler AFB for homeless military families. 6. Collected and transported another 3 tons of supplies. 7. Prepared another 2,000 meals at God's Katrina Kitchen. 8. Worked at God's Katrina Distribution Center in Pass Christian, MS.
9. Worked various projects at ARNO animal rescue center in New Orleans. 10. Biked nearly 500 miles to raise money for hurricane damaged libraries. 11. Presented $3000 check at American Library Association convention. Click here to see a You Tube video which includes our hurricane relief efforts. (starts at 4:20 in the video). We spent the week after Christmas 2008 in Texas where we helped cook hundreds of meals for vicims and volunteers in Galveston and helped rehab two homes. 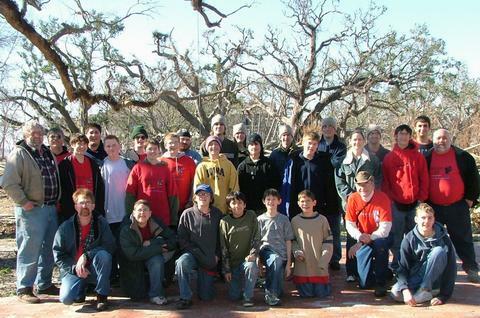 We spent our spring break 2009 in Galveston, Texas where we helped restore a historic building downtown, removed debris from yards, gutted the second floor of a house, worked to improve a city park, and hung drywall in a house we had gutted back in December. We also purchased a new motor for a church air conditioning unit. We traveled to New Jersey to help the victims of Hurricane Sandy. We invested our time doing work projects and distributing critically needed supplies. We participated in three work projects. 1.) Shared Thanksgiving with a retirement home in Middletown, NJ. 2.) Cleared debris at Windward Beach city park in Brick, NJ. 3.) Removed debris at the home of an elderly man battling cancer. 1.) FEMA collection site in Union Beach, NJ. 2.) Beacon of Hope NMCC distribution center in Hazlet, NJ. 3.) Clinton Hill Community Resource Center in Newark, NJ. 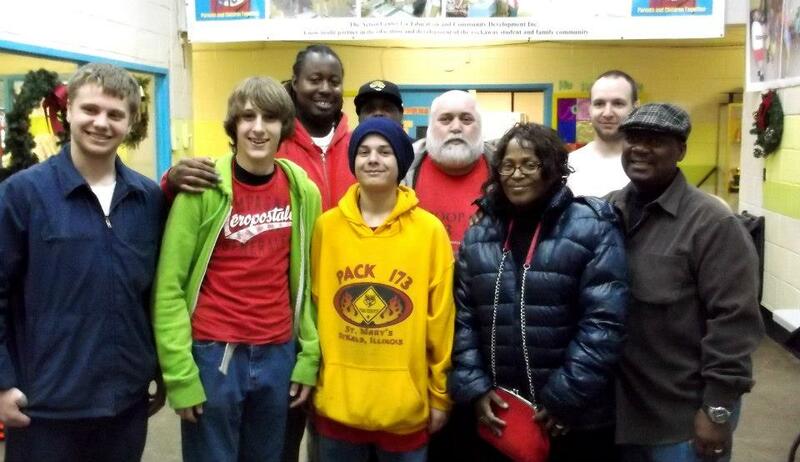 We traveled to help the victims of Hurricane Sandy. We invested our time doing work projects and distributing critically needed supplies. We participated in four work projects. 1.) Worked digging sand from homes in Ocean Beach, NJ. 2.) Helped move Memorial School in Union Beach, NJ. 4.) Worked at a distribution Center in Rockaway, NY. 1.) Memorial items to Town Hall, Newtown, CT. 2.) Operation Brick Food Relief in Brick, NJ. 3.) Renaissance Community Center in Newark, NJ. 1. Conducted collection efforts for hurricane relief. 2. Collected donations of critically needed supplies to fill 26 ft trailer. 3. Served Thanksgiving Dinner at Regal Pointe Center, Middletown, NJ. 6. Transported more supplies for hurricane relief. 7. Shoveled sand drifts away from homes in Ocean Beach, NJ. 8. Helped in moving Memorial School in Hazlet, NJ. 9. Worked at Salvation Army Emergency Response Center, Hazlet, NJ. 11. Delivered donated supplies to Brick and Newark, NJ. Hurricane Matthew was at one point a Category�5 hurricane bringing destruction and catastrophic loss of life on its journey across Haiti, Cuba, Dominican Republic, the southeastern United States, and the Canadian Maritimes. They estimate over 1,600 estimated�deaths along its route. Of the 49 deaths�in the United States, 28 were in North Carolina. When it hit North Carolina on October 8 it was a Category 1 hurricane. With the greatest damage in North Carolina, Troop 33 chose to go there directly following Christmas. We went to Lumberton, North Carolina to work with the NC Baptist Men Disaster Response, based at the Hyde Park Baptist Church. Scouts worked gutting out the crawl spaces of two houses. Gutting crawl spaces involved them wearing Tyvek suits, N95 respirators and safety glasses, and using headlamps to see in the dark. 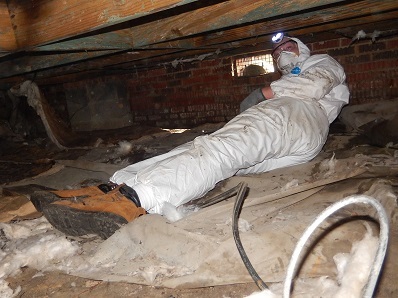 Working under houses that had been flooded, they removed ducts and insulation infected with mold and mildew, something necessary before homes can be reconstructed. Another major project involved emptying another house of contents prior to demolition. We went through the house with the family marking items to be saved. All saved items went into a large pile in the front lawn, the rest went into a large pile by the road. Everyone on the crew signed their names in Bibles that were gifted to the three families they helped. 1. Gutted the crawl space for House #1. 2. Gutted the crawl space for House #2. A gunman shot into a lecture class at Cole Hall on the Northern Illinois University campus, wounding 26 people, killing 5 students and himself. On June 1, 2008 Troop 33 sponsored the "100k Forward Together Bike Ride". The ride resulted in a $530.00 profit, which was donated to a fund for building a memorial to the students. 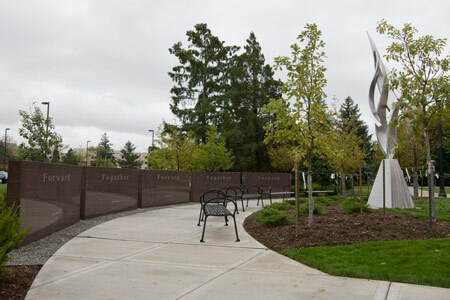 There is now a memorial garden & sculpture dedicated to the memory of the five students. The town of Newtown, Connecticut was the site of a tragic mass shooting at Sandy Hook School where 20 school children and six adults lost their lives. Troop 33 traveled there and met with city officials on December 27, 2012. 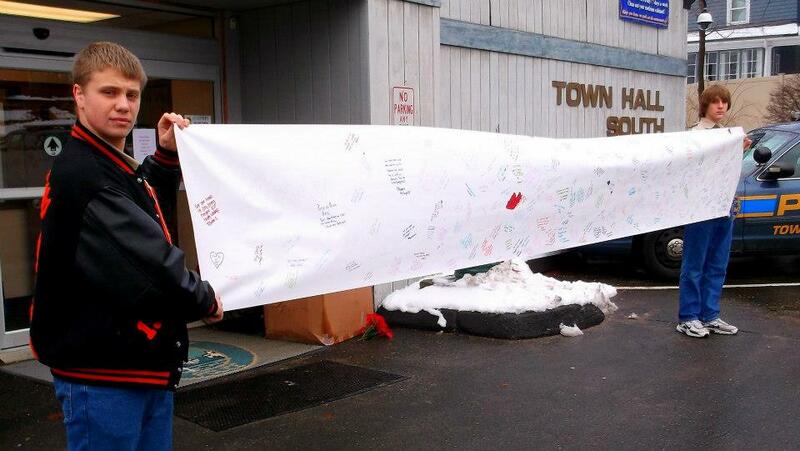 A giant banner was delivered signed by hundreds of students from DeKalb High School. A box filled with over 200 "healing bags" was donated by Cub Scout Pack 173 of DeKalb. Healing bags were filled with candy and a written note, which will be delivered to the younger students of Sandy Hook. With city approval, Troop 33 hung a Christmas angel from trees overlooking a half mast flag at Dickinson Park. Temporary memorial sites in Newtown were visited. They included thousands of memorial items on display. 1. Signature Banner (from DeKalb High School). 2. 200 Healing Bags (from Pack 173 St Mary's). 3. Installed an Angel at Dickinson Park. The 2011 Tuscaloosa tornado was an EF4 multiple-vortex tornado that devastated portions of Tuscaloosa and other areas during the late afternoon and early evening of Wednesday, April 27, 2011. There were 358 tornadoes during April 25�28, the largest tornado outbreak in U.S. history, leaving a path of destruction of 80.7 miles long and killing 64 people. We collected food and other items donating them to a family in Waterman, Illinois that traveled south to Tuscaloosa. 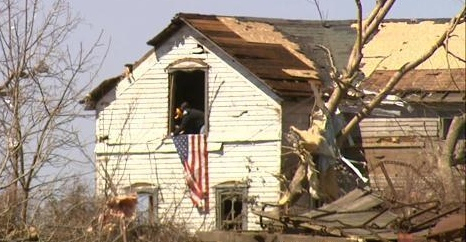 On Leap Day, February 29, 2012, Harrisburg, Illinois was struck with an EF-4 class tornado which left 8 people dead, over 100 people injured, more than 175 homes and businesses destroyed, with countless more buildings damaged, plus extensive destruction of trees and power lines. 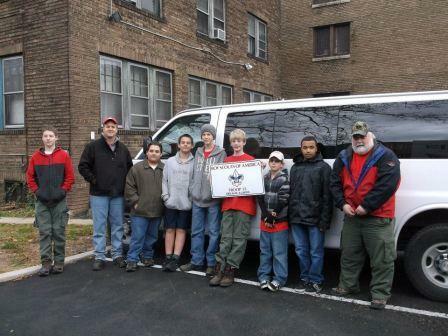 Scouts from Troop 33 traveled nearly 400 miles to Harrisburg to spend Spring Break in Harrisburg, Illinois. 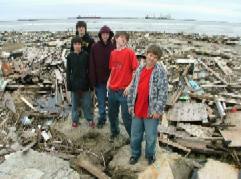 Scouts collected storm debris from 4-miles of roadway along U.S. Route 45. 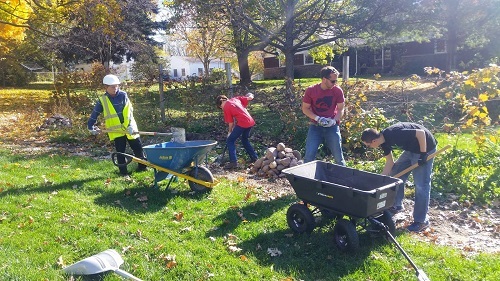 The Scouts of Troop 33 removed tons of bricks and concrete from two lots on Largent Street using wheelbarrows, shovels, rakes, buckets, a big sledge hammer. Two trailers were moved onto the properties to provide temporaty housing for homeless families. The work of the boys made an important difference in the lives of people. An EF-4 tornado touched down May 19 near Shawnee, Oklahoma causing severe damage to an area known as Steelman Acres. It damaged or destroyed about 95% of the homes. Several agencies rushed in to give aid. The very next day an EF-5 tornado hit Moore, Oklahoma and all agencies rushed to Moore, leaving Steelman Acres with no support. 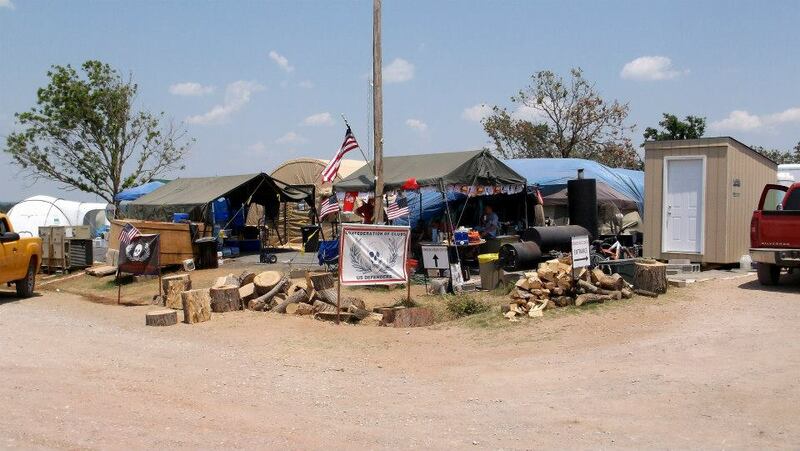 A motorcycle group known as U.S. Defenders, came to their rescue and set up a tornado relief center known as Camp Ironhorse. Scouts from Troop 33 helped with cooking meals, cleaning up areas, unloading trucks, moving tables, helping to tear down a house, and set up a shelter for a family of four. We were assigned to scout for projects in three neighborhoods in Moore, Oklahoma. We would drive down each street past each house looking for residents in need of volunteer labor. We had literature from SaveMoore.com to hand out..
At the Serve Moore volunteer HQ in Moore, Oklahoma, scouts unload a truck at their warehouse. Troop 33 Scouts delivered bottled water to the Ture Light Baptist Church near Midwest City, OK. The area was flooded by rains of the EF-5 tornado of May 31 and still suffer from unsafe water. Nearby a giant sinkhole was created on 23rd St.
AN EF-4 TORNADO HIT WASHINGTON, ILLINOIS ON NOVEMBER 17, 2013. On Nov. 17, a tornado with winds estimated at 190 mph traveled through Tazewell, Woodford, LaSalle and Livingston counties. It reached its maximum intensity in Washington, a city of about 15,000 people near Peoria. According to the National Weather Service, the tornado destroyed 633 homes, seven businesses, and seven apartment buildings and inflicted major damage on 280 homes, two businesses and a school in the city. We spent two days after Christmas, December 26,27, 2013 in Washington, Illinois where we helped clear church properties, collected debris along a roadway, sorted clothing at a donation center, and removed debris from a residential neighborhood. We stayed overnight in Washington, Illinois and worked through Bethany Community Church as a source for work projects. 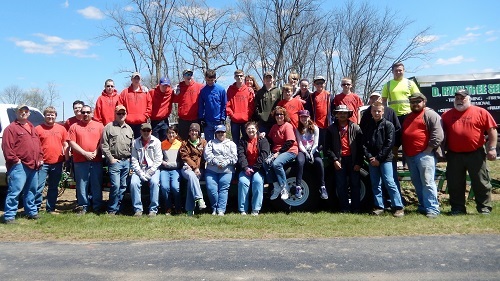 Along with Troop 33, there was also Troop 13 DeKalb and Troop 18 Sycamore working in Washington. 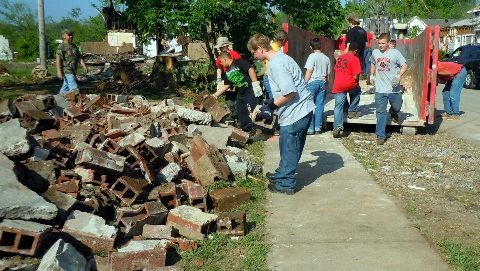 More than 150 local Boy Scouts, Cub Scouts and Scout leaders from Kishwaukee District, representing 15 Scouting units traveled to Washington, Ill. to help with tornado recovery. It may have been the first time so many different Scouting groups from our local district made a disaster relief trip together. Scout units arrived on Friday and spent the weekend in Washington. Scouts and leaders were hosted by the Roanoke United Methodist Church in the nearby town of Roanoke, which provided dinner and a place to sleep. Trinity Lutheran Church of Roanoke provided breakfast, and Bethany Community Church in Washington fed them lunch and provided work projects, supplies, bags for debris with trash bins and dump piles. 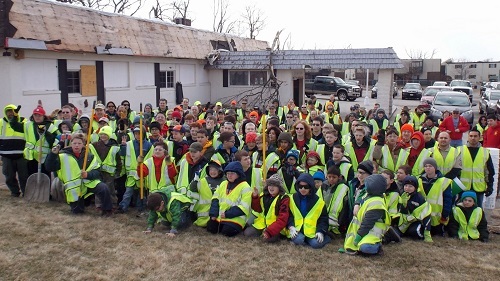 Troop 33 spent Friday and Saturday nights in Roanoke and in Washington collected debris along a section of business highway 24 Washington Road, a portion of Hillcrest Country Club and at several homes in an assigned neighborhood. On Sunday we visited the Crossroads United Methodist Church in Washington for service and a tour of their building, and also met with some tornado victims. We later attended the Methodist Church in Roanoke for their service and spent social time at their church afterwards. 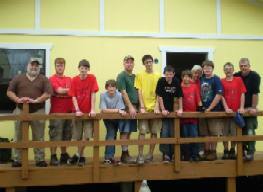 Troop 33 participated with a work crew of 19 people. We stayed three days April 28-30. In addition to work projects, we represented Scouting and talked with tornado survivors on Sunday at church services in both Washington and Roanoke. Washington, Illinois is a place we worked in December and March. We returned on October 25 to do additional work. It was a one-day service event. We drove down early in the morning, worked a full day, then returned home. The spirit of service is all about caring. We did our best to help those in need. On Sunday, Nov. 16, Bethany Community Church in Washington, Illinois�did some special things during their service�in�remembrance of�the one year anniversary of the F-4�tornado that destroyed nearly 1,000 homes. We were invited to join them. We attended their 10:30 a.m. service and were recognized, along with many others, as volunteers of the disaster relief effort. This is the church that sponsored the majority of disaster relief effort in Washington. Joining them in that event helped us�to complete�a circle of what we were involved in.� After the service we were treated to a fine luncheon at a Chinese buffet restaurant. The final part of the day was revisiting areas we had worked during December 2013, and March and October 2014.��The F-4 tornado struck on Sunday December 17, 2013.� We saw�a great deal of�progress that had been made from nearly a year ago. Some new homes had been�recently�built and�were beautiful, some homes were�still under construction, and then there were�some places still�untouched from the disaster. 1. Helped clear church properties. 2. Worked sorting clothing at a distribution center. 3. Removed debris along a roadway. 4. Cleared debris at houses at an assigned neighborhood. 5. Removed debris along a roadway. 6. Cleared debris at houses at an assigned neighborhood. 7. Talked with tornado survivors Sunday at churches. 9. Reworked a drainage project in a residential area. 10. One year observation at Bethany Community Church service. 11. Attended luncheon with church members. 12. Revisited disaster sites where we had worked. The F-4 tornado struck on April 9, 2015. Our first relief project took place April 12 within 72 hours of the disaster at the Schabacker farm on Hemstock Road northwest of Rochelle. The farm was directly hit by the tornado, leveling all the barns, destroying everything but the farmhouse. The tornado scattered debris from damaged homes immediately south of the farm covering its acreage. Fields were covered with rafters, beams, roofing and just about anything else you can imagine. With the owner�s permission, we worked walking fields and removing debris. More than a hundred other volunteer workers also removed debris that day. It was a project immediately crucial before any planting could be done. Our Scouts worked an area covering 140 acres. We walked the fields collecting debris which were placed together in large piles. Tractors pulled hay wagons to load and carry the debris away. The debris collected filled several hay wagons. 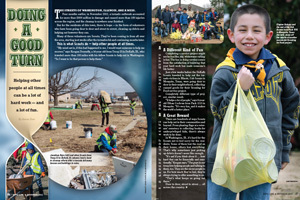 Boys Life featured our effort and video in the online version of their magazine. Our second project took place northwest of Kirkland on Wheeler Road where a wooded property lost more than 300 trees downed by the tornado. There to help clear downed trees, adults manned chain saws, older Scouts used hand saws, while younger Scouts carried wood. From the downed trees, stacks of cut wood and brush piles were created. D Ryan Tree Service donated a Bobcat and operator to move giant logs. Hard work during that day made a visible difference. To raise money for the Fairdale tornado survivors we operated a food booth on May 23, Saturday in the parking lot of RP Lumber�on Sycamore Road in DeKalb. The menu included funnel cakes,�BBQ pork, brats, dogs, chips, and cold drinks. Gift cards were also collected. We�received donations of�$10 gift cards from Walmart, Target, and Lowes.� A lot of people worked hard to make a difference.� We raised about $1300 in cash donations for prepared�food. We returned to the second project site northwest of Kirkland on Wheeler Road. We wanted to continue working on trees downed by the tornado. As we approached a thunderstorm poured down rain. We continued on to the small town of Chana hoping to use the donation center as a rainy day workplace. Unfortunately they were closed for the Memorial Day weekend. By the time we arrived in Chana the storm had passed and it was sunny again. We drove by some of the damaged areas northwest of Rochelle, including the farm we had worked at earlier, to see what progress had been made. Then a second storm came through. With the unpredictable weather and the time factor, we returned to DeKalb. Our next disaster relief effort took place in the town of Fairdale.� One this project date we worked at the old Fairdale School, now a residence, which was heavily damaged by rainwater during the storm. A basement area was saturated and mold had damaged the area. We worked to remove drywall and insulation in the area that was water damaged. On this day our Scouts from Troop 33, Troop 26 Kirkland, Troop 18 Sycamore, and Troop 40 Sycamore also worked on Fairdale projects. Debris removal at farm fields northwest of Rochelle. Project working with downed trees on Wheeler Rd. Operated a food booth in DeKalb to raise money. Attempted project to work with downed trees on Wheeler Road. Gutting partial area of the old school building in Fairdale.